New Vauxhall Meriva revealed | What Car? This is the new Vauxhall Meriva, which will be revealed at the Geneva motor show in March. 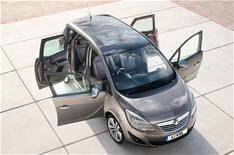 The revamped Meriva uses Vauxhall's Flexdoor rear-hinged back doors, which swing open towards the back of the car at an angle of nearly 90 degrees. This helps improve access for passengers as they leave and enter the cabin. We originally saw this car in concept form at the Geneva motor show 2008. Parents with small children also benefit from the larger door opening, with the extra space around the door pillars allowing better access to child seats. For added security, the Flexdoors can be opened only while the car is stationary. Inside the Meriva, the cabin gets Vauxhall's Flexrail system, which provides extra cubbyholes to improve practicality, while the company's Flexspace system makes it easier to reconfigure the cabin for extra load space. Occupant comfort is also improved, with the Meriva's seats based on those in the Insignia and Astra. The new seats offer a class-leading range of adjustments. With an engine line up of six turbocharged units, producing between 74- and 138bhp, the new car has an average CO2 reduction of 25g/km across the range. A greener Ecoflex model will also be made available. With a longer wheelbase and its wheels set farther apart, the new Meriva will also bring a marked improvement in ride and handling over previous versions, says Vauxhall. More information on prices and an on-sale date will be revealed closer to the Meriva's unveiling.